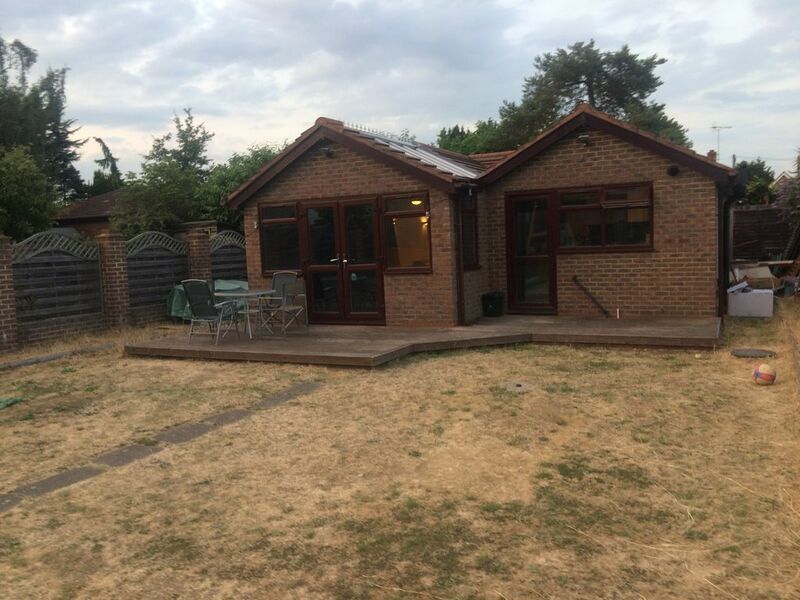 Delightful 2 bedroom bungalow located near Heathrow Airport in West London. Very close to M25, M40 and M4 motorways providing excellent links to the rest of London and England. Perfect space for families with children. Kitchen is fully equipped with a full size fridge/freezer, double induction hob, washing machine, tumble dryer, toaster, kettle, combination oven, dining set, pans, cooking utensils and cutlery. We also have WiFi and a smart TV connected to the internet and Netflix. 1 off-street car parking space reserved for guests. 5 mins drive to Uxbridge tube or Hayes & Harlington train staions. 10 mins drive to Heathrow Airport , 20 mins to Legoland Windsor Resort and only 25 minutes to the Harry Potter Studios! Guests have shared use of our large garden which has gas and coal BBQs and a large childrens play frame with fort and swings etc. We live in the main house opposite the bungalow so are on hand 24 hours a day (within reason lol) if needed. Happy to provide transport for up to 8 passengers (at a reasonable cost) depending on availability. Have lived in the area over 40 years so happy to provide tips and advice if required. Quiet and safe neighborhood. Our local MP is Boris Johnson (not sure if that is a good selling point though!). Near Heathrow airport but not in flight path so no aircraft noise! Also very close to Brunel University and Hillingdon Hospital (walking distance).